Chris does a good fry up, a most excellent start to what I was planning on being a long day in the saddle. Sam had to leave for work early however Chris, Matthew and I had a more relaxed start to the day, taking in a bit of CBeebies whilst I packed up. I do find kids TV a little disturbing at times, a bit of a sensory overload with colours and sounds. You end up having kids songs stuck in your head before you know it, accidentally humming or singing them in inappropriate places which can sometime attract odd looks. So humming a tune involving a dragon eating lots of pies, at least I think that’s what it was about, I bid my hosts goodbye and was on the road by 09.00. Thanks for putting me up Chris, Sam and Matthew, and hope to see you all again soon. Chris and Sam live halfway up one of the biggest hills in Torquay, so I immediately had a tough climb to get up the other half and down the other side to the road out of town. 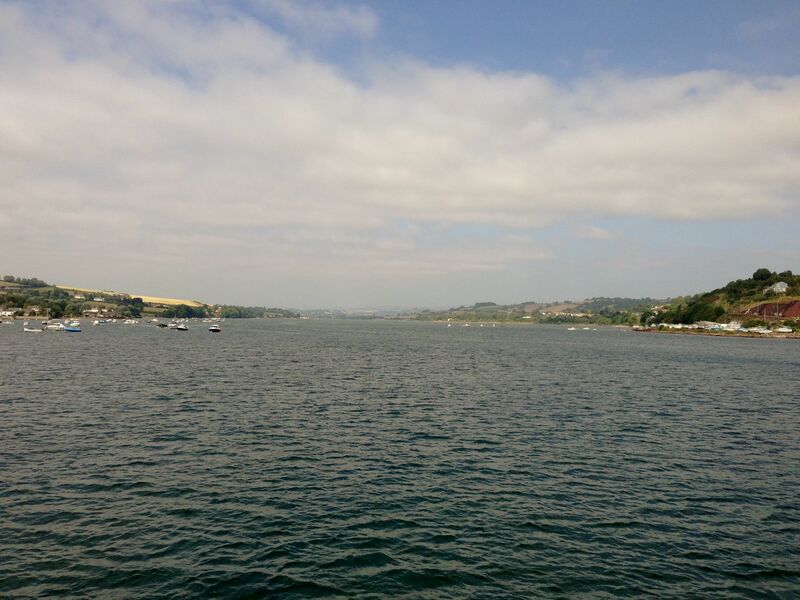 There followed a stretch along the A379 over rolling hills and through lovely countryside, before crossing the River Teign to Teignmouth. It was slightly cooler than yesterday, with a few clouds in the sky, however I suspected the sun would soon burn them off and it would turn into another hot day. I continued on to Dawlish and Cockwood, before arriving in Starcross where I intended to get the ferry over to Exmouth, rather than trek all the way inland to Exeter and back down to the coast again; a route that would have involved negotiating some very busy roads for no real benefit. The ferry leaves from the other side of the railway line in Starcross, and I had to carry my bike and panniers over the pedestrian bridge to the jetty on the other side, a good work out which left me feeling hungry. I had to wait 20 minutes for the ferry to arrive so topped up my energy levels with a few snacks, as more passengers arrived on the pontoon. The passenger ferry arrived about 11.00 and we all piled on for the trip across the River Ex, a voyage that cost me £5.50 which I thought a tad pricey, but bikes always seem to cost extra. There was a duty ship’s dog who seemed very at home on board the boat, and who was fairly interested in my panniers which must have smelt good. Unfortunately there was another dog on board who got very upset about being on a boat, and about the presence of another canine, so it was a bit of a noisy ride across with one dog threatening to tear away from its owner and chase the calm and somewhat bemused ship’s dog around the ferry. My bike and I were safely deposited in Exmouth, from where I rode along country lanes towards Sidmouth. Shortly after passing through Otterton I started encountering lots of cars jammed up on the narrow country road. The sheer volume of traffic trying to go in either direction had just brought things to a standstill, with not enough passing places. It was a bit like one of those square puzzles with lots of tiles you have to move around to make a picture, where there’s only one space you use to try get things all lined up. In this case there was a rather bewildered policeman standing in the middle of it all, trying to work out what to do. I don’t think he was helping at all, and his parked car was taking up one of the passing places. The road really isn’t suitable to be used as the main route from Sidmouth to Exmouth, and I guess the extra traffic from tourists following sat navs meant it just couldn’t cope. Feeling somewhat superior and failing to suppress a grin I was able to slip through all the cars, passing a couple of cycle tourers going the other way who judging from their expressions were finding the experience just as satisfying. I decided to be helpful as I rode past stationary and gradually overheating cars, informing their equally overheating drivers that no there wasn’t an accident, there were just too many cars on the road and it would be a better idea to turn around and find another route. They seemed appreciative of the information, and I was probably more helpful than the slightly lost policeman. Out of the traffic I rode through more beautiful Devon countryside down a steep hill into Sidmouth, passing two more cycle tourers struggling up the hill in the other direction. The two young ladies in question had the most stuff loaded onto their bikes I’d seen all tour. They were pushing their bikes west, into a region consisting mostly of more hills, so I wished them a hearty good luck. I reckoned they’d be lightening their loads shortly. 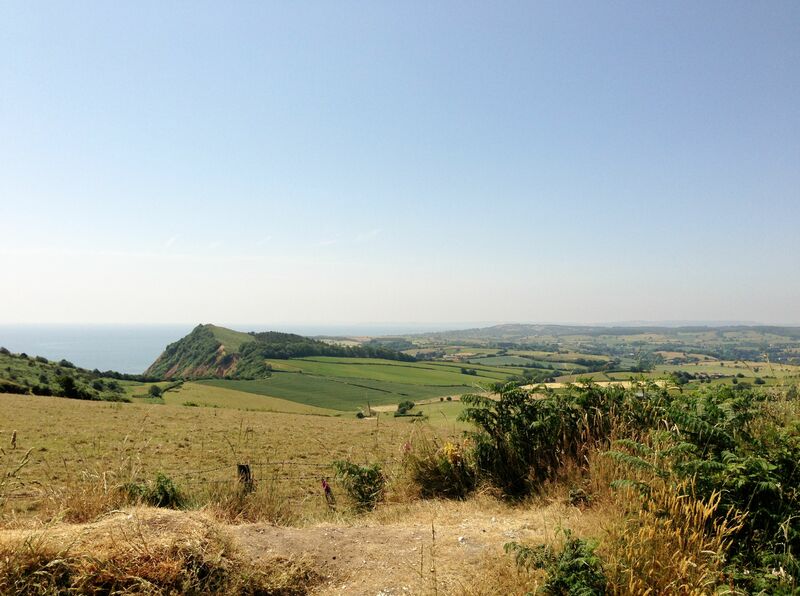 I had my own steep hill to contend with out of Sidmouth, followed by several more on my way over to Lyme Regis. I passed a Donkey Sanctuary and the village of Beer, hmmm beer, before crossing the River Axe at Seaton. I was tempted to ride up to Axminster, a few miles inland, and have lunch at the Axminster Canteen which is part of Hugh Fearnly-Whittingstall’s River Cottage empire. It would however have to wait for another day, as I was keen to get a lot more miles done and see if I could make it all the way to Bournemouth. I stopped for a break in Lyme Regis, eating a couple of banana’s instead of a posh deli lunch at the Axminster Canteen, and attracting the attention of a seagull who was slightly disappointed I only had fruit and not fish and chips. Lyme Regis was packed with tourists enjoying the beach and town, and hunting for fossils for which the area is famous. 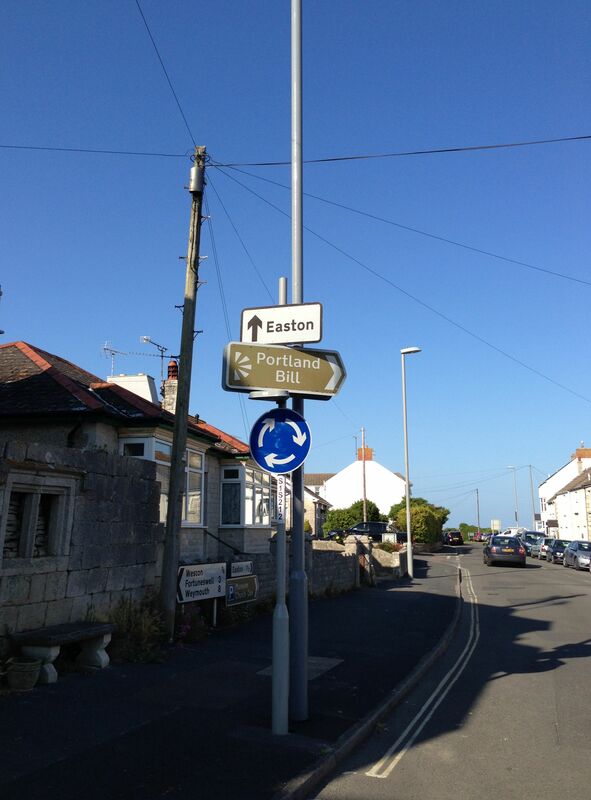 I was in Dorset now, and making good progress. Leaving historic Lyme Regis I pedalled along the coast road, having to take the A35 for a bit before turning on to the less busy B3157 just past Bridport. 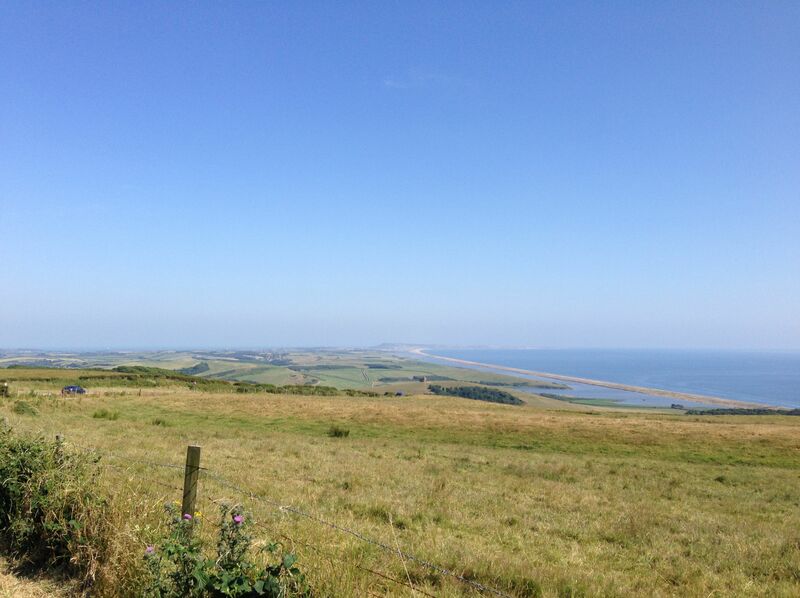 The Dorset coast is stunning, but the hills are relentless with continuous ups and downs as I rode along the Jurassic coastline. 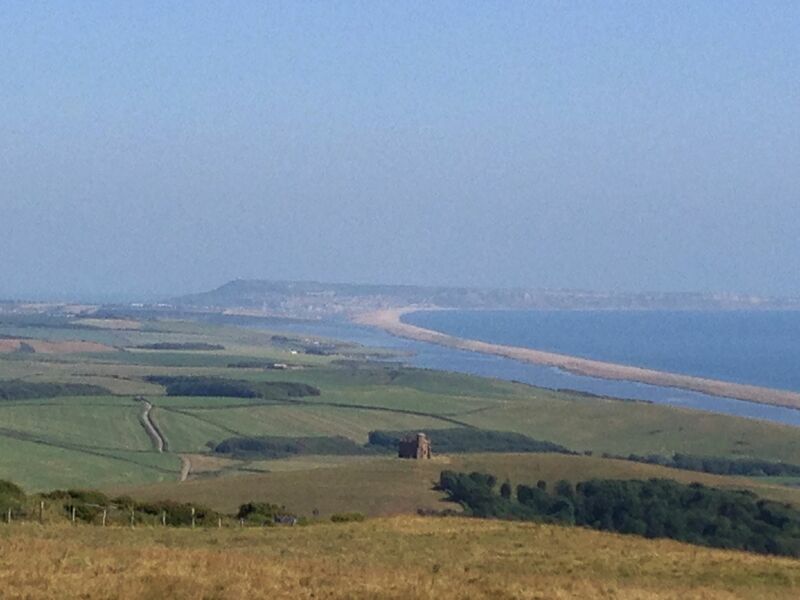 With Chesil Beach on my right, an 18 miles shingle bank which joins the Isle of Portland to the mainland, I rode on towards Weymouth, the site of the Olympic sailing competition a year before. Chesil Beach is another good place to go fossil hunting, and Lucy and I had visited it several years before when her parents lived in Weymouth, and a few years before that for New Year, with our friend Wayne who’s parents also live down here. I don’t know if it still is but it used to be a great place to go out for New Year’s Eve, with everyone dressing up in fancy dress and the whole town coming alive, with a great atmosphere. I remember Nigel, who joined me for the first evening of the tour, carrying Lu out into the sea on New Years Eve (the bay is very shallow in parts), and thankfully not dropping her. Happy memories. 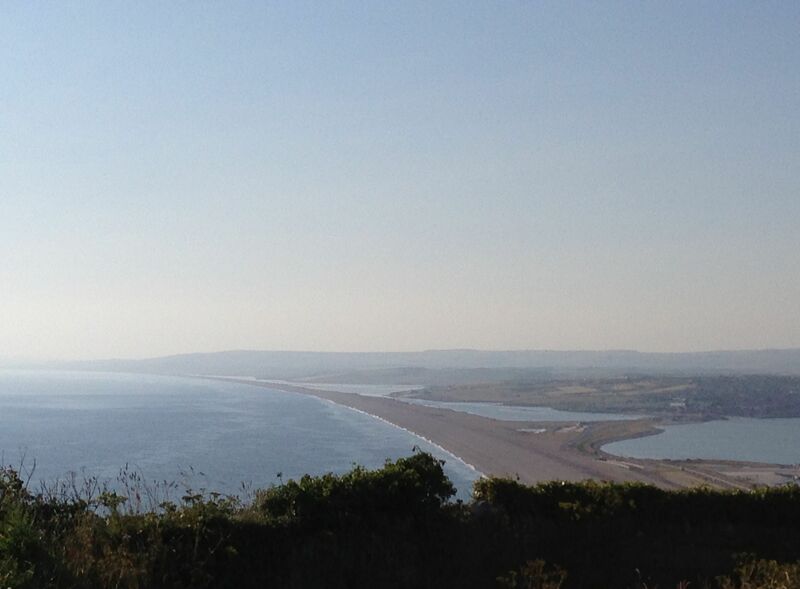 The Isle of Portland slowly appeared out of the haze as I rode east. Despite the bright sunshine it was a cooler day, and although I’d slowed up over the hills the miles were still passing at a good rate, mainly because I was ignoring any promising looking pubs. I kept seeing the same vintage Spitfire sports car for a while, which seemed to be going backwards and forwards along the coast road. A great day to be out driving with your top down, but I was getting slightly paranoid they were stalking me. For some reason I decided I’d include Portland on my tour, I’m not sure why seeing as there’s a big hill you have to tackle just as you get onto the island. The Isle has a rich history having been inhabited since the Mesolithic era. The Romans had a settlement there, and Henry VIII built a castle to defend against the French. Portland limestone has been used for centuries, Sir Christopher Wren having built St. Paul’s Cathedral from it. Hundreds of thousands of gravestones were also made from it post the two World Wars. I struggled up the initial hill, stopping half-way to visit a Co-op and refuel on two pints of chocolate milk, before performing a quick circuit of the island. I passed the turning to the famous Portland Bill lighthouse, but had been before so decided to press on back towards Weymouth. The coast around here has claimed many a ship so the lighthouse, now like so many operated remotely, has provided an important service over the years. I was quite glad to get off the island, having been slightly abused by a few impatient and aggressive drivers. 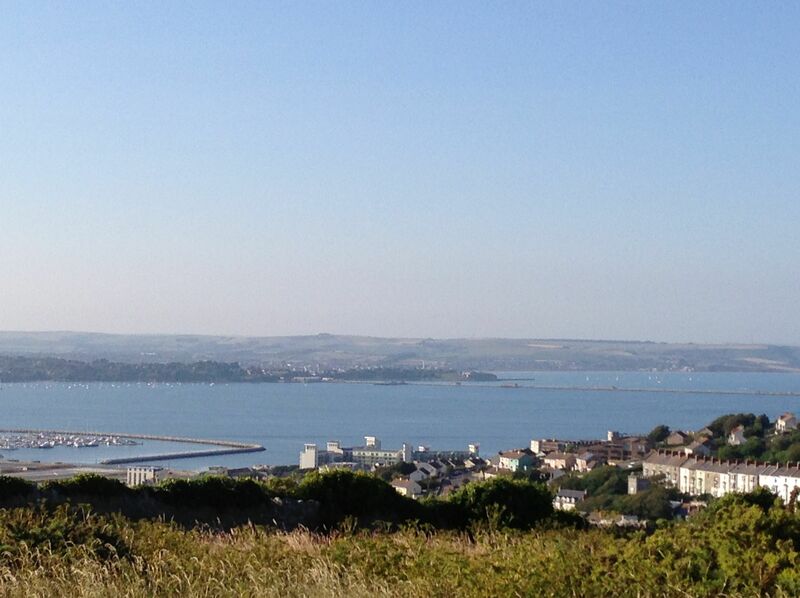 I rode back down the hill and across the land-bridge to Weymouth, passing Portland Harbour which is one of the largest man made harbours in the world. It used to be a naval base, and is now a civilian port. Weymouth was packed with holiday makers enjoying the town and beach, and had changed quite a bit since I was last there due to the building completed for the Olympics. 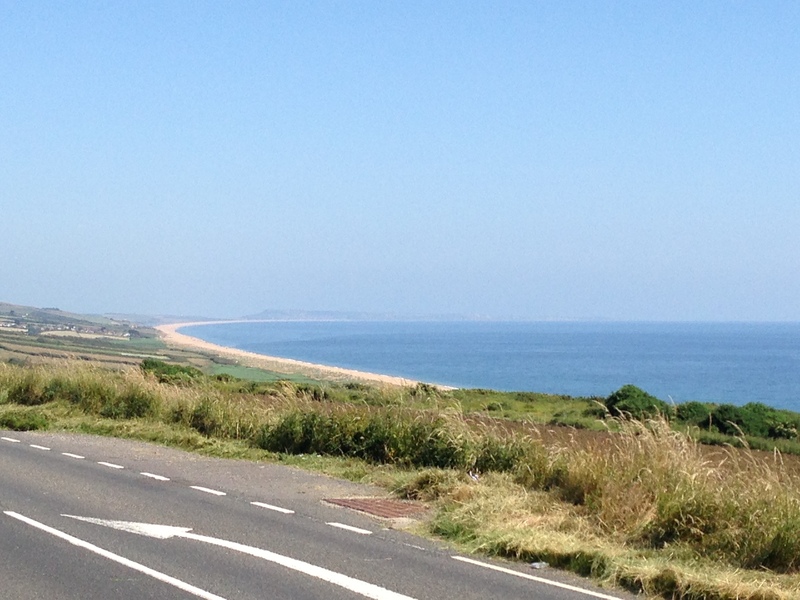 I pedalled along the seafront and out of the town, deciding I would try and make it to friends living in Wimborne, just outside Bournemouth, rather than find somewhere to camp. I still had a fair few miles to cover and realised I would be cycling into the dark, but my legs were still feeling fresh at this point, and I was keen to push myself to see just how far I could go in one day. I passed the familiar white horse carved in the hillside just outside Weymouth, and the turning to the Smugglers Inn at Osmington Mills, of which I had fond memories from visiting with Lucy and her family. The terrain flattened out somewhat over the next stretch, as I rode down the A352 for a bit before turning off it at Wool down to Combe Keynes and East Lulworth. The light was starting to fade as I pedalled across the Purbeck Hills, entering an army exercise area. It was getting on for 21.00 and there was no-one else around, leaving me alone in beautiful surroundings. For company I just had cows, deer and a fox than ran down the road ahead of me before dashing off into the gorse chasing a rabbit. 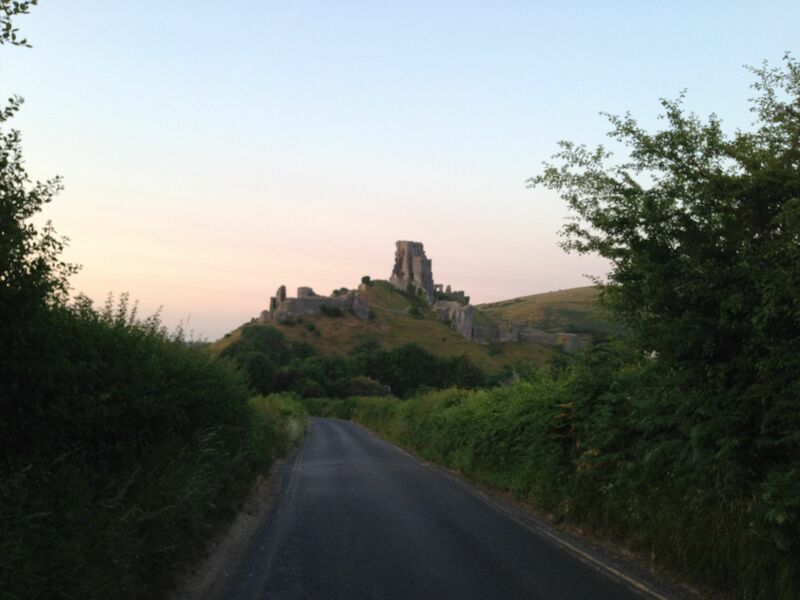 The air smelt really fresh and delicious, and I stopped for a break after climbing the Purbecks to watch the sunset. 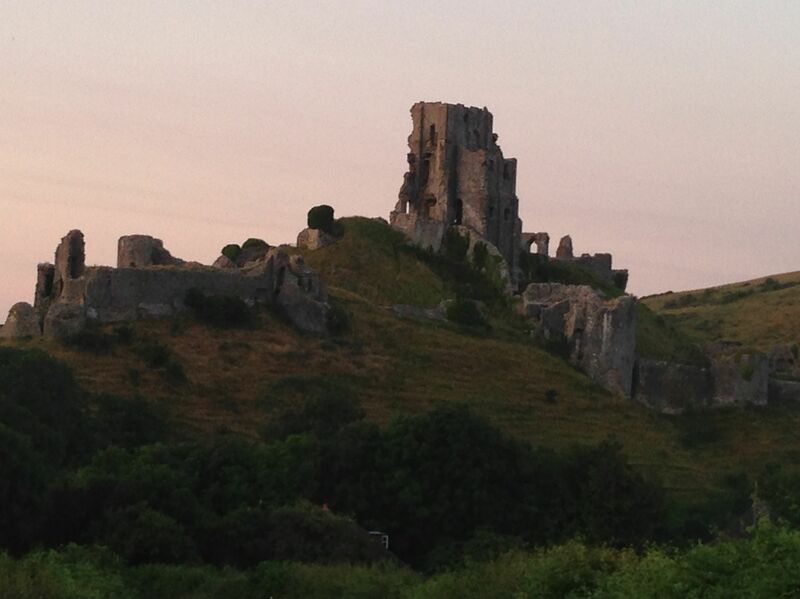 I continued on out of the MOD firing range and down to Corfe Castle, with the light fading further and making the castle look impressive. The castle was built by William the Conqueror in the 11th century, and ended up being mostly demolished in 1645 after Parliamentarian forces assaulted it in the English Civil War. It was one of the last remaining strongholds fpr the Royalists, and they obviously didn’t want to have to go to the trouble of another lengthy siege in the future. I had to turn on my lights as I pedalled across the Isle of Purbeck, which isn’t an island as far as I can tell, making my way to the chain ferry near Studland. My legs were starting to get really tired now, having been on the go for over 12 hours, and I had to break out the Haribos just to keep the wheels turning. There were quite a few cyclists out enjoying the evening, and making there way to the ferry at a slightly quicker pace than I. I texted Steve to let him know I was on my way, and not far from the ferry, and that I might need some directions after I got into Poole Harbour. After what seemed like a long time I finally made it to the chain ferry, eating a Bounce Bar whilst I waited for it to clunk its way across from Sandbanks. 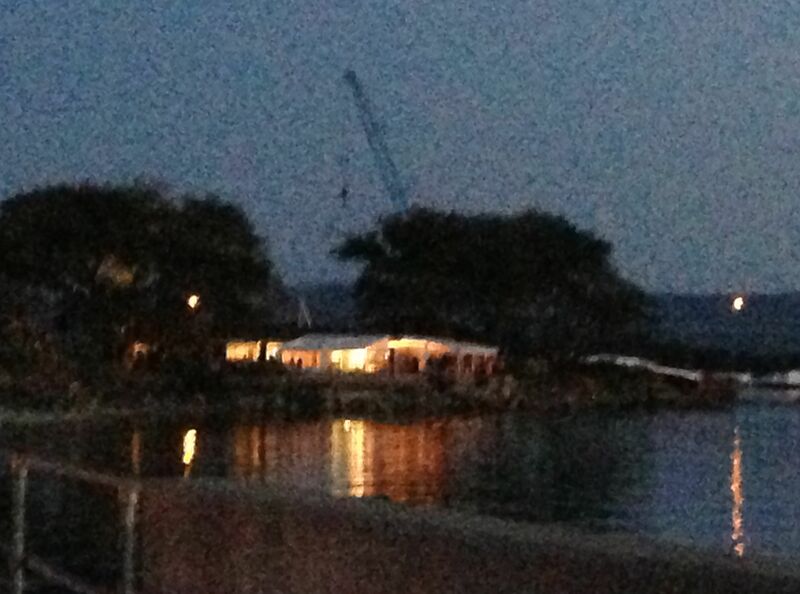 There was a party going on at the bar/restaurant next to the ferry station, with Cuban music echoing across the otherwise peaceful landscape. I liked the music and it sounded like people were having a lot of fun, but it seemed a little out of place in the tranquil surroundings. The camera on my phone doesn’t take photos too well in the dark, and I accidentally left the flash on which immediately drained the last of my battery. I really needed my phone to communicate with the Headley’s, with whom I was staying this evening, and to use Google maps to make my way to their house. It was at times like this I needed my Garmin Edge to be working, however that hadn’t happened for weeks and I still needed to get in touch with them to organise a replacement; their phone lines are always jammed and it cost me money to hang about on hold. Thankfully my PowerMonkey battery was fully charged, there having been lots of sunshine of late, so I was able to plug my phone into charge. 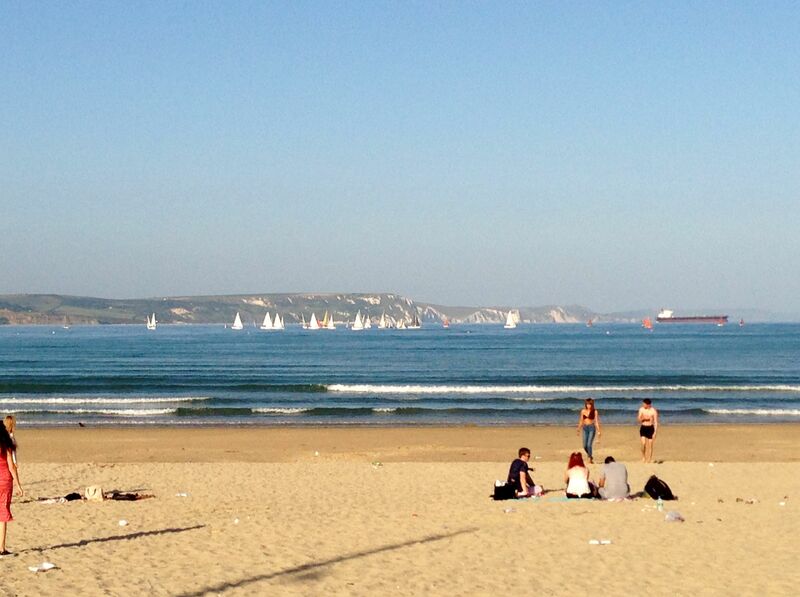 The ferry over to Sandbanks and Poole Harbour ended up being quite busy, as I was joined by several groups of slightly the worse for wear party-goers returning home, and a group of male cycle tourers who’d been out for a days ride. I chatted with the latter for a while, learning one of them had done his Jogle a few weeks before. I described some of my journey to date, realising I was fast approaching the end of my own tour, especially after riding well over 100 miles today. 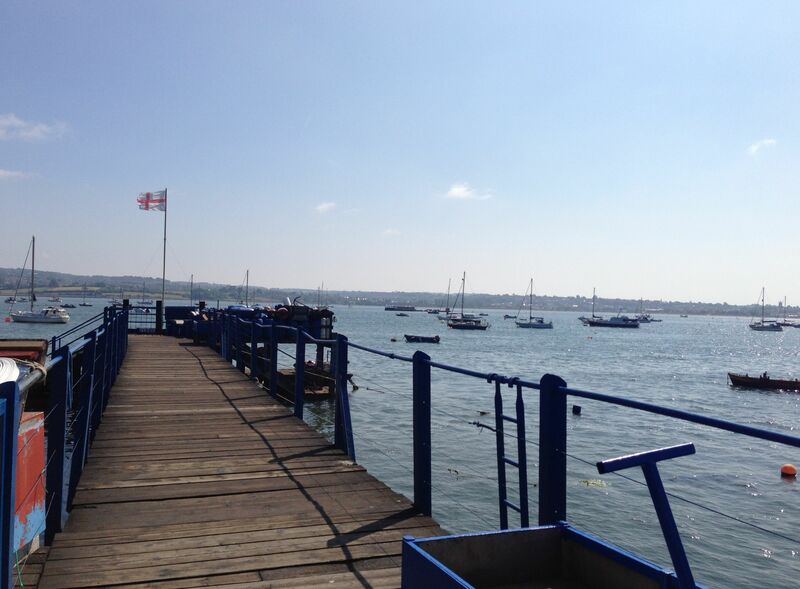 I rode into Poole Harbour, one of if not the most expensive place to live in Britain outside London. It’s a huge natural harbour, and I could make our Brownsea Island where Red Squirrels still find a home as the Greys can’t get to them. Poole Harbour is another place humans have lived for thousands of years, the Romans having launched there invasion of England around-bouts, and it being an important port ever since. 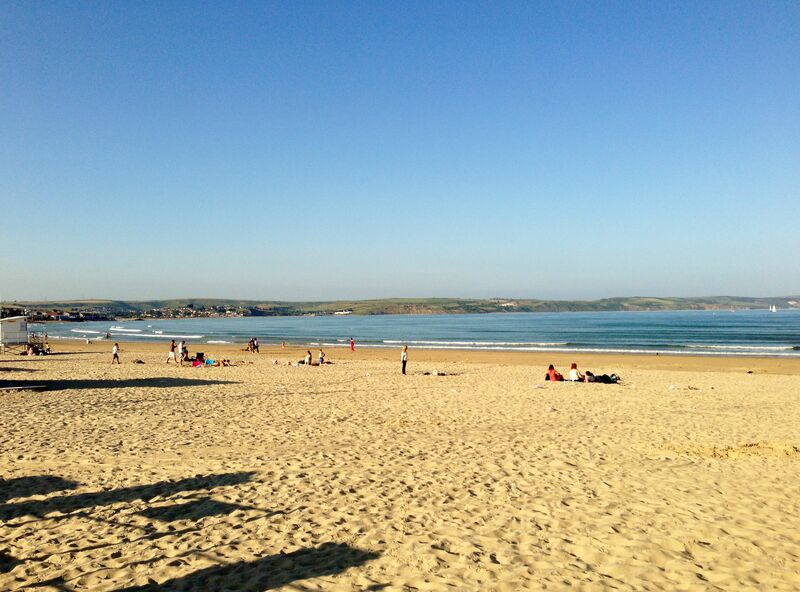 It’s an ideal venue for lots of water sports too. My energy levels had been somewhat boosted after consuming a vast number of Haribos, so I pedalled quickly towards where I hoped Wimborne was. After travelling a few hundred yards from the ferry I heard a loud shout from behind me, which I initially ignored thinking it was probably drunk kids being funny, although that would have been a little out of place somewhere like Poole Harbour. The rich kids around here probably don’t need to hang about outside a local Spar drinking dodgy cider, they don’t know what they’re missing; not sure they even have Spar’s in Poole Harbour, probably only M&S and Waitrose. I was further alarmed when I heard a rider approaching me rapidly from behind, however on glancing back I recognised the familiar face of Steve who’d cycled down from Wimborne to meet me. This was very much appreciated seeing as my phone wasn’t really charged as yet, so I wasn’t sure of my route, and being very tired would have probably ended up somewhere odd. I followed Steve down cycle paths I’d never have found on my own, around Poole Harbour and off towards Wimborne Minster. At one point we were stopped by police who were looking after someone that had collapsed on the path just ahead of us, and who didn’t want us running them over. We think they were just drunk (the injured party rather than the police) rather than anything more sinister, and we were able to just cycle around them. 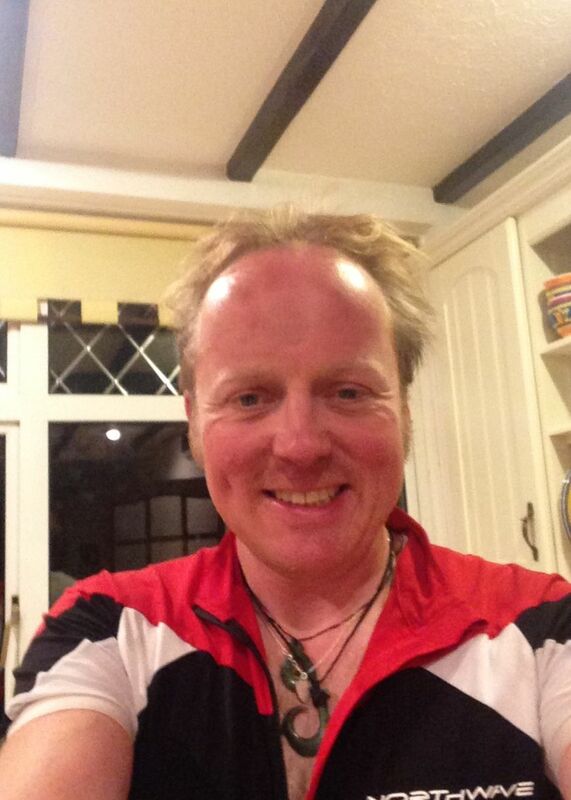 We arrived in Colehill just outside Wimborne at about 23.30, after a final hill climb that stole the last of my energy. I was tired and very thirsty having run out of water a while back, but extremely satisfied to have covered what I later worked out was 128.5 miles, the longest leg of my tour. The Headleys are old family friends and it was great to see them, and great to have made it before Pete and Diane left for Scotland the day after. I was welcomed with warm hugs, several glasses of water, a cold beer and some thai curry, all of which I was extremely grateful for. Tomorrow I’d be pressing on towards Chichester via Portsmouth, and hopefully meeting up with my friend Ian who was joining me for a day or two. I was a little worried about what sort of state my legs were going to be in the morning, but for now I just hit the sack, and slept very deeply. This entry was posted in Bike around Britain 2013 and tagged adventure, bicycle, bike, Bike around Britain, charity, Corfe Castle, countryside, cycle, cycle touring, cycling, expedition, fundraising, outdoors, photos, Poole Harbour, Purbeck Hills, sunshine, Weymouth on September 28, 2013 by SelfPropelled. A very enjoyable read. Brings back memories of when Mum and Dad lived there.